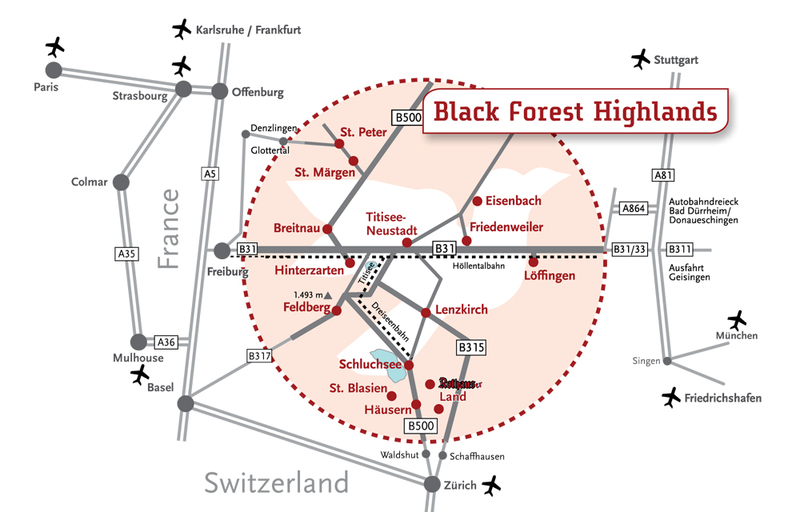 Whether by rail, road or air – the Black Forest Highlands holiday region is easy to get to from all directions. The IC and ICE network of German Railways will get you to Freiburg. From there, you can get a train every half hour to Hinterzarten and Titisee, with an hourly connection to Titisee-Neustadt (from there you have connections to Donaueschingen), Rötenbach, Löffingen, Feldberg-Bärental, Feldberg-Falkau and Schluchsee. You can also get there using the Stuttgart – Rottweil – Donaueschingen connection. These airports have many domestic and international connecting flights (e.g. several daily flights to Berlin or Hamburg at low fares). Local taxi firms are also happy to pick you up from the airport.